Welcome! Here at First Churches we are committed to helping children follow in the way of Jesus as they grow and explore questions of faith. If you would like to subscribe to our monthly children + youth newsletter please contact pastorsarah@firstchurches.org. On Sunday mornings we begin worship with the whole church community and then, right before the adults settle in for the sermon, kids age 4-12 head to the children’s wing where we continue our exploration of that morning’s Bible reading with Whirl. 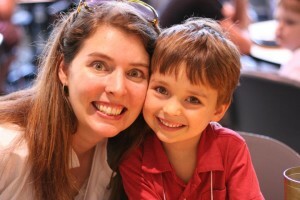 Whirl is a playful Sunday school experience rooted in the rhythms of the church year. 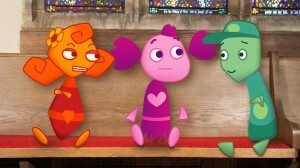 With the help of some very colorful and eccentric characters (like Ruby, Mimi, and Gabe pictured here), we delve deep into themes from each Sunday’s Bible readings. For youth we offer monthly activities, Sunday school classes, and confirmation class. The teens join us in worship the first Sunday of the month – which is our communion Sunday. Confirmation class happens after church on communion Sundays from 11:30-1:30. Once a month, we team up with St. John’s the local Episcopal church, for fun activities like hiking, apple picking, or over nights. The highlight of the year is often when we go on retreat. For more information, please subscribe to our children + youth newsletter by contacting pastorsarah@firstchurches.org. Pastor Sarah is the mother of two elementary school age children, and as such she is deeply invested in the spiritual education of young people and the question of how we nurture their inner lives while passing on the stories of our faith to the next generation. Sarah is a graduate of Smith College and Harvard Divinity School. She is also the founding pastor of Common Ground, a family style farm-to-table dinner church that is another ministry of First Churches.